Olympus OM-D, ISO 200, f22, 10.56 sec (for pic above). 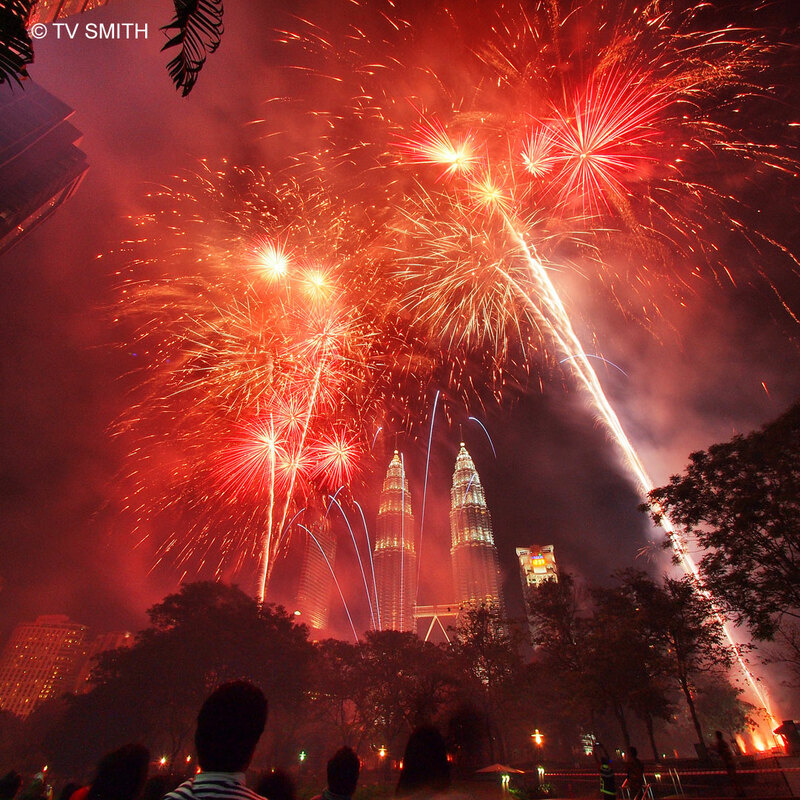 Fireworks Photography Tip 1: Juxtapose the fireworks against a landmark or skyline. A shot of fireworks alone in the sky, however nice, doesn’t say much. It could have been photographed in any city. Fireworks Photography Tip 2: Use a speed slower than 2 seconds to maximise the flowing effect of the burst and to better capture the sparkle. It means you will need a tripod. For users of recent Olympus cameras, just set it to Live Time in Bulb mode and watch the exposure develop on the LCD screen. Stop when you feel it is nice enough. This takes the guesswork out of shooting blind in B manual mode. Olympus OM-D, ISO 200, f22, 6.46 sec (for pic below). Fireworks Photography Tip 3: Get your act together as fast as possible. The view gets progressively smoky after the first or second minute. 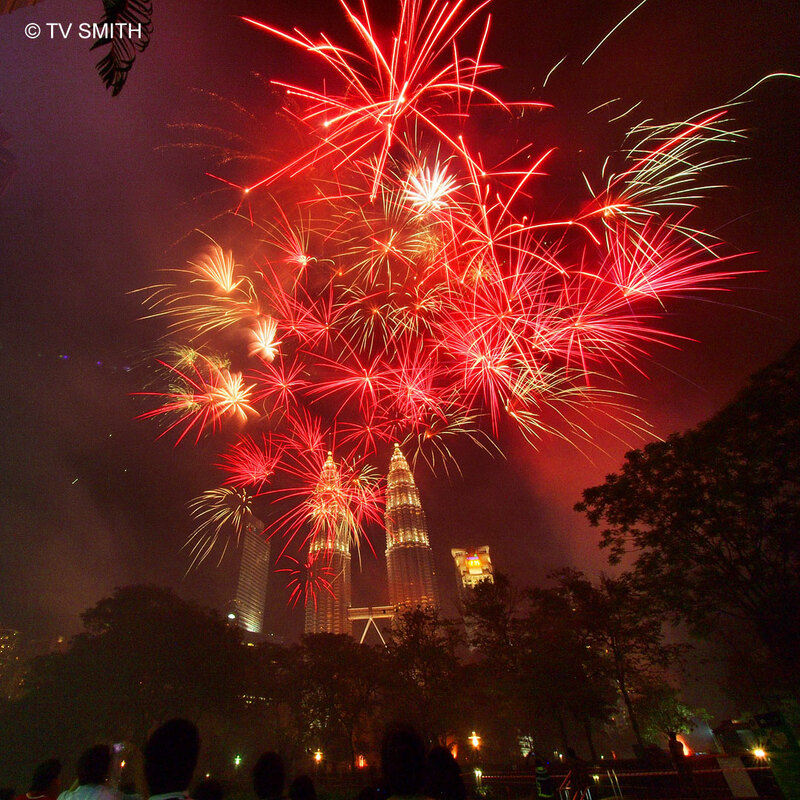 After that, lingering smoke usually gets too heavy and may obscure the landmark or the fireworks itself. The smoke will also create a colour cast. And one most important tip: Once you get your settings correct, just fire away but alternately look at the sky. Take in the beauty with your naked eyes directly, not by viewing through a viewfinder or LCD throughout. In this case, I had no choice but to look up. I was so near the epicentre that chunks of burning sulphur and hot ash were landing few inches away. Olympus OM-D, ISO 200, f16, 3.58 sec (for pic below). 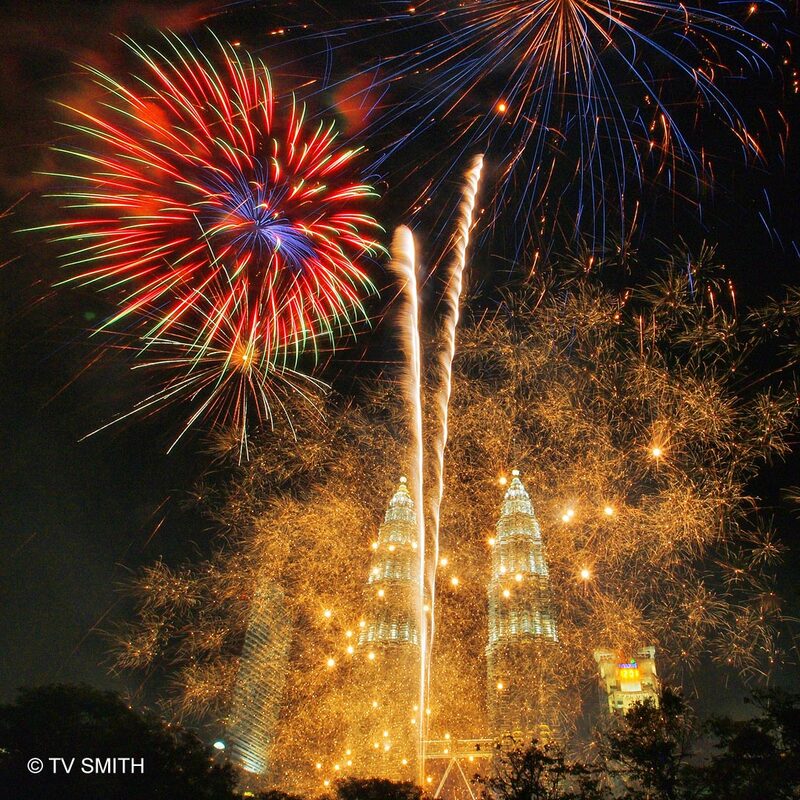 This entry was posted in Culture & Festivals, Geography, Instagram, Life, Olympus OM-D, Photography and tagged bunga api, celebrations, fireworks, klcc, kuala lumpur, landmark, malaysia, new year's eve, night, nye, petronas twin towers, skyline by TV Smith. Bookmark the permalink.